This blini recipe could be described as a Russian pancake and that wouldn't be far off the mark, however it's what goes with it that creates the hullabaloo, butter, sour cream and Caviar. But don't forget the dry Champagne, wine or, best of all, iced vodka! Old Chechonia.! !Note: You can change the number of people served by placing your cursor over "Servings". The Ingredients will adjust to the new number of servings. Blini batter - prepare about 2 1/2 hours before you plan to serve the blini. Stir the dry yeast into 1/2 cup of warm, not hot, water and let stand for about 5 minutes. If it does not show signs of some bubbling or rising, throw it away and try again. Pour the yeast into a blender jar and add the milk, flour, egg yolks, salt, sugar and melted butter. Blend at high speed for about 40 seconds; turn off the blender and scrape down the sides with a rubber spatula. Blend a few seconds longer then pour the batter into a mixing bowl and cover with food wrap. Let the batter rest for 2 hours in a warm place. Beat the egg whites with a pinch of salt until they are stiff, then fold them into the batter. In a large cast iron skillet, brush it lightly with butter. Ladle out enough batter for a 3" blini, leaving enough space to easily turn them over. Cook until lightly browned on each side, turning them only once. To serve, arrange three blini on each plate and bathe them with a little of the clarified butter. Drop a small dollop of sour cream on each one and top with spoonfuls of caviar. Serve at once. Blini are frequently made with buckwheat flour or a combination of buckwheat and white flours. The buckwheat tends to produce a heavier pancake but if you like it, it may be substituted all or in part for the white. It isn't necessary to limit yourself to caviar. 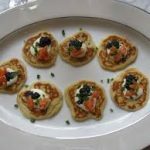 You can serve blini with a variety of smoked fish, such as whitefish, herring or salmon.